A notebook is a book blank sheets that you can write or draw in. Remember to take your notebook to class. 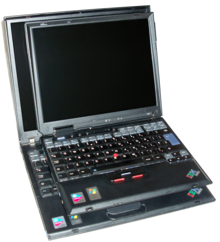 Sometimes laptop computers are called notebooks; this is not as common as calling them laptops. This page was last edited on 24 April 2017, at 00:48.